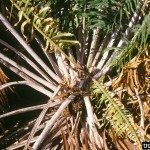 We have sago palms in pots that are 4 to 5 years old. When we transplanted to larger pots about 2 years ago, we noticed the roots were 'coiled' and quite long. After putting them in larger pots to allow for more growth, they seemed to do very well. This year they have not grown as in the past, and I suspect the roots have continued to coil and they are probably root bound and packed. Can you cut the root to allow for more growth in pots? It is possible the roots are still coiling. This can happen. You can cut them, but first try "teasing" them. This is basically roughing them up a little (like you might a little kid's hair) to get them out of the circular path. If this does not do it, then cut. The reason I am hesitant to suggest the cutting off the bat is that it may leave too little roots to support the current size of the plant, so those should be used as a last resort.